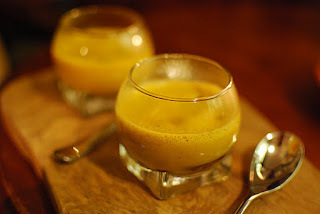 Toptable recently asked a selection of food bloggers, including me, to list their top five favourite restaurants of 2011. Simon ‘LeEnclume’ Rogan’s short lease, London outpost. 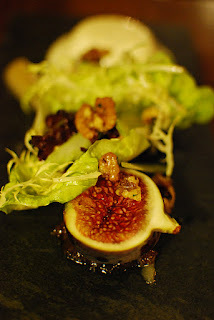 Impossibly beautiful, elegant, delicious and interesting food full of unusual foraged ingredients. I had an amazing lunch here and loved it. Book and go sooner rather than later, in case it does actually vanish when the lease runs out! José Pizarro’s Bermondsey tapas and sherry bar is a gem. Authentic, always busy and full of atmosphere. Serving incredible, fresh, rustic and well priced simple food. Squeeze in, and order a glass of Manzanilla and a plate of Pluma Iberica before working through the rest of the menu. It’s all good. 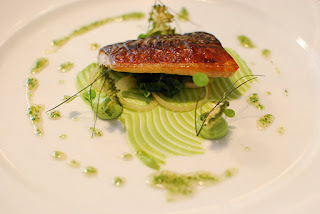 A recent tasting menu at this Michelin starred pub just outside Bristol blew me away. Chef Josh Eggleton’s small charming old boozer serves beautifully judged seasonal food with a British slant. Easily the best meal I’ve eaten in Bristol and ridiculously cheap. Get in quick before they put the prices up! 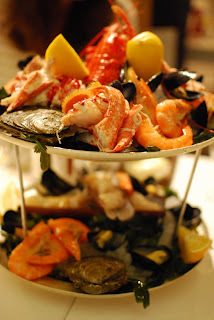 Mark Hix’s Lyme Regis restaurant is bloody fantastic. Perched on a hill overlooking the sea and serving elegant, simple, British food utilising locally caught seafood and foraged ingredients. I had an absolutely unforgettable meal here and can’t wait to go back. I finally made pilgrimage to the holy grail of pub restaurants this year and holy-moly, was it worth it. The ‘must have’ tasting menu was without a doubt the best meal I’ve eaten all year, in actual fact, quite possibly the best meal I’ve ever had, anywhere. Astounding. If you haven’t been yet, make it your No.1 resolution for 2012, you wont regret it. To see what my fellow food bloggers picked - Head this way. Eating out quite often, as I do, it’s a rare and rather wonderful thing to eat somewhere and be completely taken by surprise by the whole experience. In this case, to be honest, I was less surprised and more absolutely blown away. 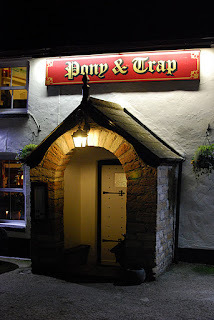 Last weekend, a meal at The Pony & Trap in Chew Magna, just outside Bristol, massively exceeded any expectation I had and has left me gagging to go back and eat there again. 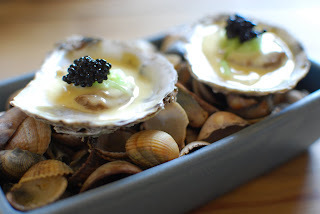 I first heard of The Pony & Trap pub when it was awarded a Michelin star just over a year ago (Michelin may have it’s faults, but they definitely play a role in bringing some new quality restaurants to the public’s attention). I’ve been wanting to give it a try ever since, but it’s countryside location, around 10 miles south of the city always seemed a bit of a pain in the arse to get to, especially when, like me, you don’t have a car. I was pleasantly surprised to find however, after phoning around taxi firms for a quote, that the cab fare each way from central Bristol was a not entirely ruinous £20 making a visit entirely doable. Cue headlights briefly illuminating a tree lined, pitch-black country lane, the slow crunch and pop of tires on gravel and the warm friendly glow emanating from within the pub, spilling out of the windows into the car park. The brief murmur of voices and then the sudden quiet, cold, still night air as twin red brake lights silently disappear into the darkness of the lane. ‘E’ and I had arrived. The Pony & Trap despite it’s Michelin Star is still a proper old country pub; it’s retained the rustic, low ceilinged, timber framed look and it’s all the more impressive for it. It actually feels like you can walk in, and drink a beer at the small bar and wouldn’t feel uncomfortable doing so, despite the fact the vast majority of the pub is undoubtedly laid out for dining. We’d come to review the pub for the Great British Chefs blog and had decided to try the six course tasting menu. Reading through, it looked superb, full of interesting local ingredients and feeling distinctly British in theme. We ordered a drink, sat down and settled in. 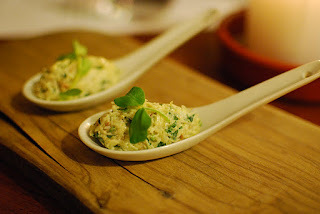 It’s not long before an amuse arrived, Cornish Crab, Roast Garlic and Saffron Mayonnaise. A fantastic mouthful of fresh tasting, subtly flavoured white crabmeat, beautifully simple but with a delicious taste which set the tone for the rest of the evening. 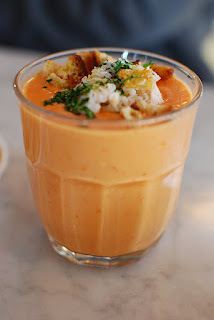 Another amuse arrived in a small verrine glass containing a hot Crab Bisque with olive oil. It was beautiful. Silky smooth and incredibly rich. ‘E’ and I glanced at each other and silently rolled our eyes in a well-rehearsed look that all at once said ‘this is bloody good’ and ‘we’re in for a treat’. 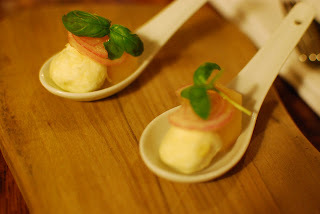 A canapé followed; Pickled Beetroot & Ewe’s curd. Topped with a thin slice of shallot, I counted only three ingredients, so very simple yet absolutely phenomenal as I ate the lot and let the flavours play across my tongue. The curd coating the mouth and then the pickled beetroot and shallot cutting through the creaminess with a tangy sweetness. I recognised the Ewe’s curd as locally made by Tim & Angela Homewood. Some bread followed, olive foccacia with a choice of homemade butters, anchovy or regular salted. The anchovy butter in particular was lovely, quite subtle and very savoury. At this point, our first courses arrived. 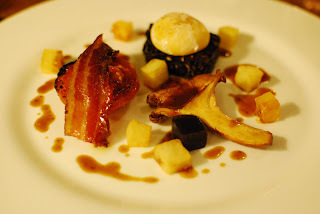 A somewhat unusual take on a Full English Breakfast for me, consisting of soft poached hen’s yolk, hodge-podge (homemade black pudding) fried potato, roasted mushroom jelly, slow roast tomato, tomato compote, pancetta and truffle cream. Got that? Bloody hell, absolute genius. I loved it, the classic English breakfast taken to the extreme with all of the composite flavours intensified. I liked the sheer fun and playfulness of it, using something very British, very familiar and taking a different slant on it. Really impressive and even more so because it tasted amazing. ‘E’ being the pesky pescetarian had an alternative first course of a Blue Cheese Panacotta with Smoked Pear Puree, Celery, Walnuts and Black Fig. Presumably this was equally impressive as she began quietly chanting the mantra ‘Oh my God, I don’t even like blue cheese and figs normally’ repeatedly. Lost in my own pseudo breakfast revelry, it took me a little while to realise she’d repeated the same sentence about 5 times and needed a slight nudge to break her out of the broken record loop. She loved it. 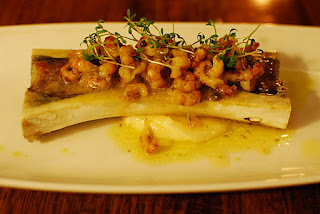 How does Grilled Bone Marrow, Brown Shrimp Butter with Capers, Garlic & Lime and Celeriac Puree (with toast to smear it all on) sound to you? To me it sounded like absolute frigging heaven. I’m pleased to say I wasn’t disappointed. 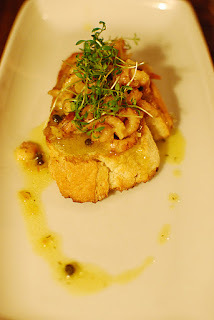 In a genius new take on surf n’turf I gorged myself on the sticky marrow coated prawns muckily smeared all over the accompanying toast and had to restrain a strong urge to tongue the bone. Absolutely filthy, in a good way. Meanwhile, studiously ignoring my bone tonguing antics across the table, pescetarian ‘E’ ate more or less the same dish minus bone, on toast and was equally impressed. A small piece of Roasted Hake, atop a bed of chicken stock cream sauce, diced ham, chestnut mushrooms, girolles and tarragon followed. 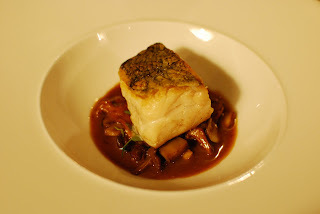 The fish and meaty sauce worked surprisingly well together, a good interesting dish but to be honest, the previous two courses were a hard act to follow and amazingly for me I was starting to get a bit full up. 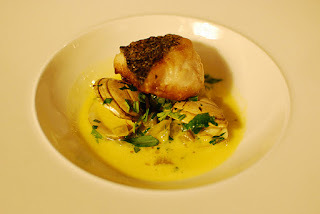 ‘E’ had the same roasted Hake atop a Clam, Saffron and Potato Broth and ploughed through it, declaring it delicious and that she was also starting to get slightly full now. The waiter had recommended a particular wine to go with this dish, and I make note of it here because it was absolutely spot on, and something I could happily drink all day long ‘Grüner Veltliner, Soellner Fumburg 2008’. Rabbit made an appearance next, stuffed with poached venison and wrapped with Parma ham. 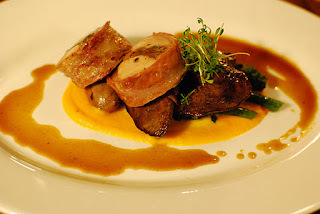 Served with carrot puree, char-grilled purple sprouting broccoli, rabbit liver, heart and a red wine sauce. Bit of a classic this one, very good, nicely cooked. Nice to see the liver and heart on the plate, they have a fantastic flavour. I really was stuffed silly by this point. 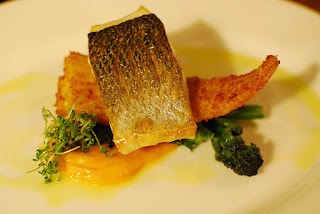 Pan Fried Fillet of Cornish Bass with a Haddock Fish Finger and the same carrot puree and char grilled purple sprouting broccoli for ‘E’. She was also nearing ‘full’ on the tank, but still managed to put it all away and once again declare it superb. 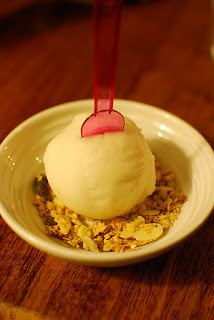 Over the brow and racing downhill to dessert, a lovely little light and refreshing bowl of apple sorbet with some granola for texture followed. I liked the cheap plastic seaside style ice cream spoons. 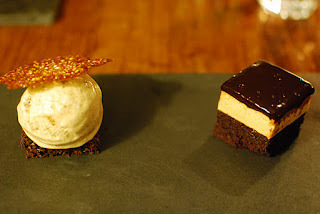 Dessert proper, a Peanut Butter Mousse and Dark Chocolate layered Chocolate Cake with Gingerbread, Gingerbread Ice-Cream and a Sesame Tuille. Very rich, maybe a little too rich as an end to such an epic meal. I particularly liked the gingerbread ice-cream which had an amazing viscous texture. 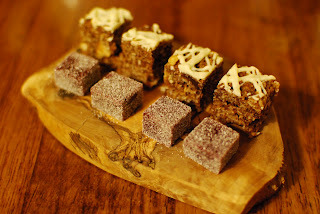 Finally, coffee served with some chocolate flapjack and rather delicious beetroot pastilles petit four. So, a bloody incredible tasting menu with some amazing and inventive cooking, by the extremely talented Michelin starred chef, Josh Eggleton. We met him briefly afterwards and he struck me as very genuine and down to earth. A very nice guy who seems mildly surprised that he’s received a Michelin Star. Based on what we ate, he undoubtedly deserves it. This was up there as one of the best meals I’ve eaten all year, and is without a doubt the best meal I’ve eaten anywhere in Bristol. I can’t recommend it enough. Massively impressed. If I had any criticism of the tasting menu at all, and this is hardly a criticism, it’d be too much food! ‘E’ and myself are gluttons of some renown and we struggled near the end. Maybe ditch the bread next time? A quick mention of the service, obviously in this case they knew I was coming, so it was bound to be attentive. But, nevertheless our rather tall waiter was very impressive. He knew both the wine list and all the dishes on the menu inside out, including the ingredients, suppliers and how they were prepared and struck the perfect pitch between friendly and professional. It’s surprisingly hard to get right and he was bloody good. Bravo. So bearing all that in mind, how much do you think you’d pay for a tasting menu like that, excluding service and booze? What if I told you it was £45 each. That’s right, £45! I think anyone would agree that this is an absolutely ridiculous bargain of the highest order. I also had a quick look through the a la carte menu and the prices are equally bargainous. All I can say is go, and go quick before they come to their senses and put the prices up.